For the first time in many years Saturday 24 March saw Tweedvale Pipe Band take part in an early season indoor contest. The Band travelled to Sanquhar in Dumfries and Galloway to take part in the RSPBA Ayrshire Dumfries and Galloway Branch Indoor Contest which was held in Sanquhar Academy. Tweedvale Pipe Band was drawn to play fourth in the Grade 4A MSR event out of five entered bands, though in the event only four bands played. The Grade 4A MSR event was won by Irvine and District PB. In addition to the band performance, two soloists from the band took part in the solo events. Logan Thorburn played in the chanter event in his first ever contest. Arran Cameron played in the under 14 March event and took 2nd place. Tweedvale’s contest season will resume in early may when the Band will compete at the traditional outdoor season opener at Dunbar. A full programme of competitions interspersed with street parades and other engagements will follow on throughout the summer. Contest venue – Sanquhar Academy, Sanquhar. Grade 4A MSR – Walter Douglas MBE, Archie Duncan, Colonel MacLeod. Number of Pipers – 8. Number of Tenor Drummers – 2. The full results of the RSPBA ADG Branch Sanquhar Indoor Pipe Band Contest Grade 4A MSR contest can be found here. The last Saturday of May saw Tweedvale Pipe Band travel the short distance to West Lothian to take part in the pipe band contests at the West Lothian Highland Games, which were held in Meadow Park Bathgate. Tweedvale Pipe Band was drawn to play first in the Grade 4 March event out of three entered bands, their only event of the day. As it turned out only two bands played on the day, one having withdrawn. Playing in decent though changeable weather, the Band put in a creditable performance of their MSR set though probably not quite as good as the performance the previous week at the British Championships. The only other band to play on the day was Camelon & District who, when the results were announced, were placed first with Tweedvale second. The Tweedvale drum corps were placed first by the drumming judge. Two RSPBA Lothian & Borders Branch Shields were awarded to the band for these achievements. Tweedvale’s contest season will resume in late July when they band intend to participate in the Scottish Pipe Band Championships. In the intervening time the band will, as Innerleithen Pipe Band, be taking part in local festivals including the Peebles Beltane, the Walkerburn Summer festival and the St Ronan’s Border Games Week, as well as undertaking further fundraising events including its annual coffee morning which is being held this coming Saturday 03 June. The Band will also participate in the inaugural Innerleithen MusicFest on the same day. Grade 4A MSR – P/M Donald McLean’s Farewell to Oban, Men of Argyll, Molly Connell, The Keel Row, Lexy McAskill and Captain Lachlan McPhail of Tiree. Number of Side Drummers – 5 in Grade 4A MSR. The full results of the Bathgate Pipe Band Contest Grade 4A MSR contest can be found here. Tweedvale Pipe Band travelled to Paisley on Saturday 21 May to take part in the British Pipe Band Championships at St James’ Playing Fields, the first major championship of the RSPBA season and the second time the event had been held at this wide open venue. The event enjoyed relatively good weather, certainly earlier in the day when the lower grade bands including Tweedvale played – though a more pressing distraction for some bands was the sound of aircraft taking off from Glasgow Airport, which was separated from the contest venue by the width of the M8 motorway. The band was drawn to play 5th out of 19 bands, with 17 of the entered bands playing. Playing their March, Strathspey and Reel set of “P/M Donald McLean’s Farewell to Oban”, “Men of Argyll”, “Molly Connell”, “The Keel Row”, “Lexy McAskill” and “Flora, Mrs Macleod of MacLeod”. Tweedvale put in a much much improved performance from the previous week’s effort at Dunbar, with the general consensus of band opinion afterwards was that the performance was pretty solid with good sound and tempo, and few errors. When the results were announced Tweedvale found that it had been placed 11th overall. The piping judges gave the band placings of 13th and 12th whilst the drumming judge placed the band 5th and the ensemble judge 7th. The Grade 4A contest was won by the Denny and Dunipace Gleneagles. Band thanks are offered to BARC Coach Hire for supplying the coach that took the band through to Paisley. Tweedvale Pipe Band’s season continues this Saturday 27 May when the band will be found heading to West Lothian to take part in the pipe band contest at the West Lothian Highland Games in Meadow Park, Bathgate. The Bathgate contest will see the band performing once with its MSR set of “P/M Donald McLean’s Farewell to Oban”, “Men of Argyll”, “Molly Connell”, “The Keel Row”, “Lexy McAskill” and “Captain Lachlan McPhail of Tiree” in the Grade 4A MSR contest. A slightly later departure time of 08.00am will see the band through to West Lothian in good time to take the field 1st out of 4 bands in the Grade 4 MSR contest commencing at 11.50am. Grade 4 MSR – P/M Donald McLean’s Farewell to Oban, Men of Argyll, Molly Connell, The Keel Row, Lexy McAskill and Captain Lachlan McPhail of Tiree. The full results of the British Championships Grade 4A MSR contest can be found here. Tweedvale Pipe Band travelled to East Lothian on Saturday 13 May to take part in the thirty fifth annual pipe band contest at the Hallhill Centre Dunbar, traditionally the first outdoor pipe band contest of the new season in the RSPBA Lothian and Borders area. The consensus of opinion is the that performance was horrifically horrendous with lots of note errors and nerves very evident. We are entered in the Grade 3 event which is also an MSR, but whether this happens is being debated. We’ll keep you posted. In the event the band did compete in the Grade 3 contest but it was pretty evident that no-ones heart was in it and whilst it was better than the Grade 4 effort it proved that much work has to be undertaken to get the band up to contest speed. The band played 3rd out of 14 bands in the Grade 3 contest. When the results were announced Tweedvale found itself well out of the prizes, coming 5th out of 7 bands in Grade 4A and 11th out of 11 bands in Grade 3. Dunbar was the first of three pipe band contests in May for Tweedvale Pipe Band. Following on from Dunbar was the first major of the season the British Championships at Paisley. The weekend after sees the band heading to West Lothian to take part in the pipe band contest at Bathgate on the last Saturday of May. Number of Side Drummers – 3 in Grade 4. The full results of the Dunbar Pipe Band Contest Grade 4A MSR contest can be found here. The full results of the Dunbar Pipe Band Contest Grade 3 MSR contest can be found here. Winter is generally a quiet time for pipe bands with preparation for the forthcoming pipe band season and fundraising featuring heavily in band activity. Innerleithen Pipe Band has been no different. This post is a summary of Band activity in the first few months of 2017. 1. ATTENDANCE – 17 band members attended. 2. MINUTES OF 2016 AGM – the minutes of the 2016 AGM were approved by the meeting. There were no matters arising. 3. ACCOUNTS – the treasurer tabled accounts for 2016 and spoke to them. Total receipts in 2016 were £14,611.00; total payments were £13,860.00 leaving a surplus of £751.00. Bank account balances at the year-end comprised £3426.84. Complete Band accounts can be viewed on the Band Administration page. 5. COMMITTEE ELECTION – the current committee stood down and all bar Bethany Thomson were proposed for re-election. Rhiann Hamilton was nominated for election. No other nominations were received therefore the committee of Charles Gray (Secretary), Steven Gibb (Chairman), Linda Ridley (Treasurer), Bruce Gillie, Rosemary Gordon, Ross McLaren, Jim Doherty, Lynsey Thomson and Rhiann Hamilton was elected for 2017. 7. SUBSCRIPTIONS – the meeting was reminded of the current arrangements for subscriptions and bus fares – the subscription rate for all band members was £10 per annum and bus fares to each contest was £5 (players/non-playing members), £7 (non-players/non-members) and £2 (under 16’s all). An amendment was proposed that if a band member had not paid their membership fee by the end of April, then that member should be charged the non-member non-player bus fare rate of £7. This was agreed by the meeting. MEMBERSHIP FEES ARE THEREFORE DUE NOW! 8. CONTESTS AND ENGAGEMENTS – after discussion it was agreed to try and attend the local pipe band contests at Dunbar, Bathgate, Edinburgh, North Berwick, Peebles and Innerleithen and the Majors at Paisley (British), Dumbarton(Scottish) and Glasgow(Worlds) as well as the usual street engagements, dependent on band member availability. 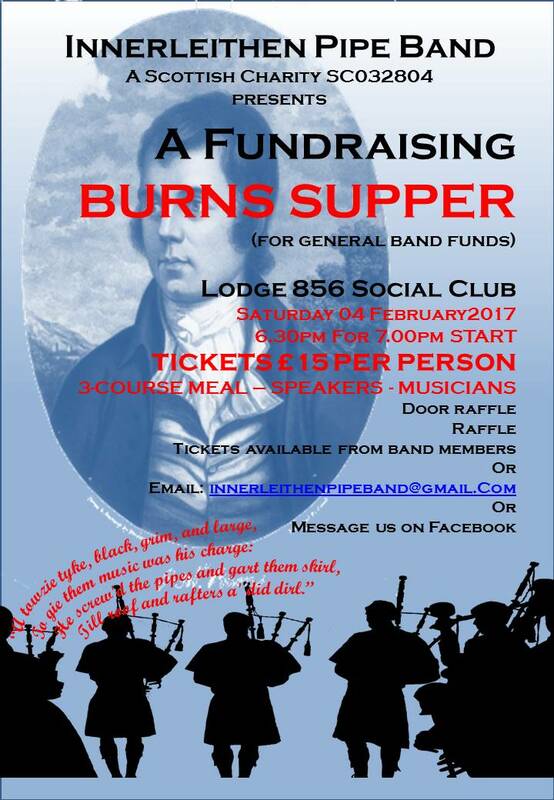 On Saturday 04 February, the Band held a fundraising Burns Supper in Lodge 856 Social Club, Innerleithen. The event was a great success for the Band, raising £600.00 for band funds whilst everyone who attended had a very enjoyable evening’s entertainment celebrating our national Bard. Many thanks go to everyone who turned up to support the event, all who donated raffle prizes, and especially our speakers and performers whose contributions were invaluable – Rhiann Hamilton who gave “The Selkirk Grace”, Rachel Anderson who piped in the haggis, John Connor who Addressed the Haggis with customary gusto, Jim Borthwick who gave an impressive “Immortal Memory”, Steven Gibb who gave a witty Toast to the Lassies, Kerrie Gibb who gave an equally witty Reply from the Lassies, 11 members of the Band who gave a fine tag-team rendition of “Tam O Shanter” and Rosemary Gordon who demonstrated a fine command of highland dancing to the piping accompaniment of Bruce Gillie, all of which was presided over in masterly style by the MC for the evening, Alan Thomson. Interspersed amongst the speeches were fine musical contributions from Vi and Charlie Graham which were much appreciated by the company. Special thanks are also due to our chef for the evening Mr David Fulton who provided the company with a wonderful three course meal, ably assisted by Emma Gray, Anne Tunnah, Sharon Heath and Stevie Potts. The Band would also like to extend its thanks to the committee, members and staff of Lodge 856 Social Club for the use of their function hall to hold the Burns Supper. The rest of February was a quieter month with little Band activity. Band members though were busy with various members guesting with the pipe band that annually visits Bailleul in northern France for Carnival. Band members also welcomed friends from Wales for the Six Nations rugby, performing in various local pubs and clubs. March (as well as January and February) has seen the Band hard at work preparing for the forthcoming pipe band competition season. Competition sets have to be prepared based on the criteria laid out by the RSPBA. Sets were chosen before Christmas and now the Band has them up on the pipes and drums. The sets chosen for this years contests comprise the following tunes – a quick march set of “Greenwoodside”, “The Earl of Mansfield”, “McKay’s Farewell to the 74th” and “The Pipers Cave” which is the same set as 2016, and an MSR set comprising “Donald McLean’s Farewell to Oban”, “Men of Argyll”, “Molly Connell”, “The Keel Row”, “Lexy McAskill” and “Captain Lachlan McPahil of Tiree” which has only slightly altered from the 2016, with a change of tune for the last reel. The Band’s next fundraising event is also in hand. 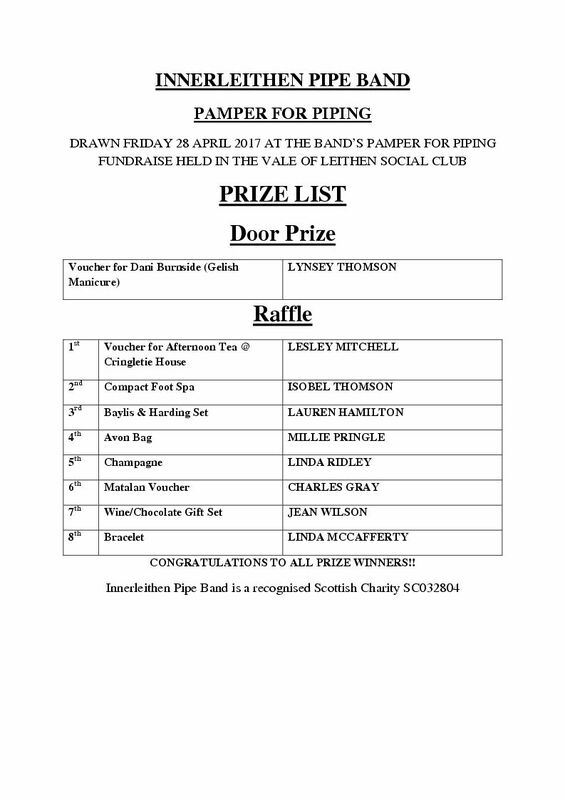 The annual PipeBand-A-Thon will be held on Saturday 01 April from 8.00am to 8.00pm in the Vale Club Innerleithen. 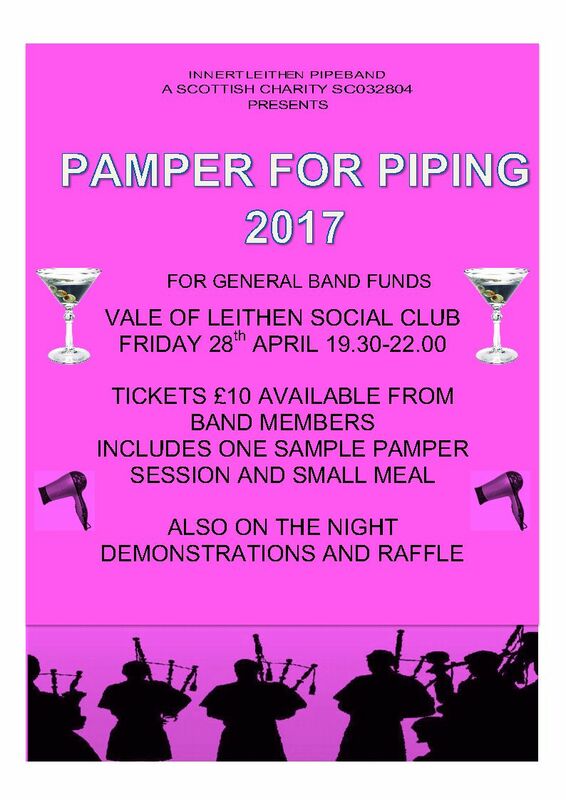 Not only is this one of the main annual fundraisers for the Band, it is a great opportunity for the playing Band Members to have a practice day working on tunes and instruments prior the the new pipe band season commencing in early May. The Band is still registered with JustGiving to allow supporters to pledge donations online. 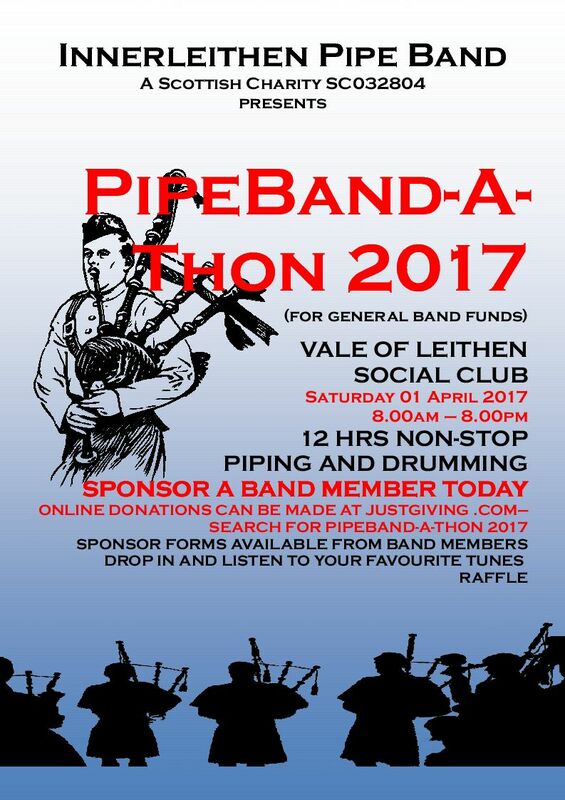 The Band’s campaign page can be found here – PipeBand-A-Thon 2017, where supporters can donate direct to the Band or donate to individual fundraisers who are listed on the right hand side of the page. The penultimate contest of the 2016 pipe band season saw Tweedvale Pipe Band on home ground competing in the pipe band contest at the Peebles Highland Games. 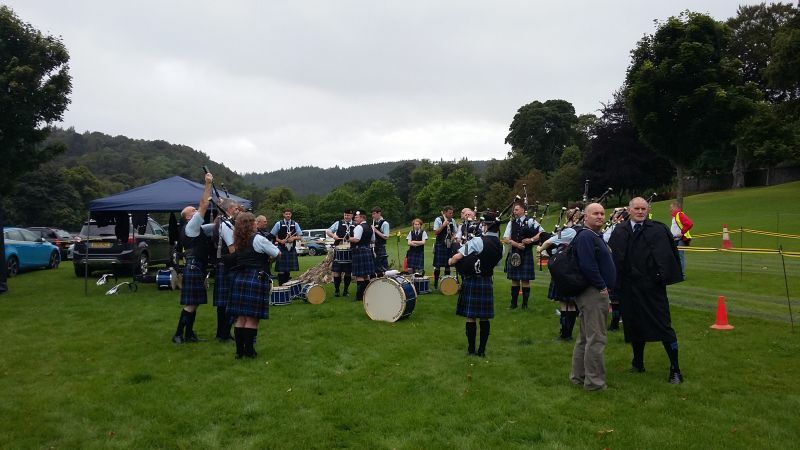 Held in its traditional venue of Hay Lodge Park, the Peebles Highland Games enjoyed typically variable September weather, which made for challenging conditions in which to set up a pipe band sound. Tweedvale played once in the Grade 4 contest with their march set comprising Greenwoodside, The Earl of Mansfield, McKay’s Farewell to the 74th and The Piper’s Cave. The band put in a very creditable performance of their set, so much so that the Pipe Major announced himself content with the display immediately after the performance, always a bad sign for the overall result!! When the results were announced, Tweedvale Pipe Band was been placed 5th in Grade 4, with piping placed 6th and drumming place 5th. The Grade 4 contest was won by Bowhill and District Pipe Band. After the prize-giving ceremony was concluded, Tweedvale Pipe Band, along with several others, paraded down from Hay Lodge Park to Peebles High Street entertaining sizeable crowds that had gathered in the early evening sunshine. Contest venue – Hay Lodge park, Peebles. Number of Side Drummers – 6. Tweedvale Pipe Band travelled to Glasgow on Saturday 13 August to participate in the largest pipe band contest on the planet, the World Pipe Band Championships. Held on Glasgow Green, the World’s attracted 230 bands from all across the globe to compete for the coveted title of World Champions in front of 35,000 spectators from all around the world. 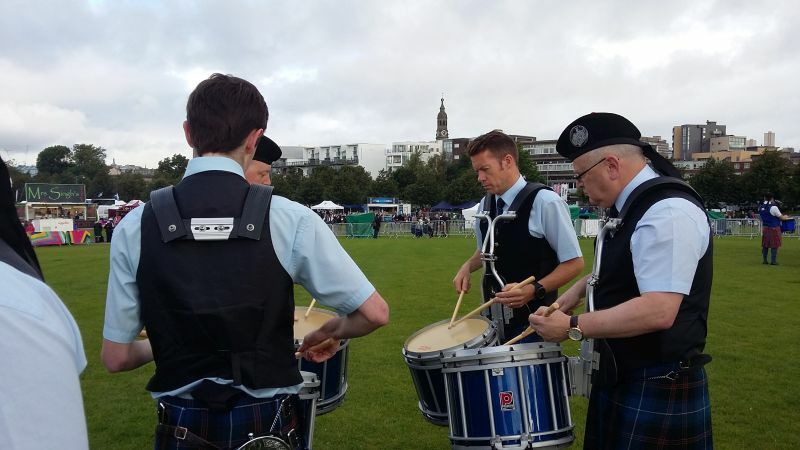 Tweedvale Pipe Band arrived in Glasgow just after 6.55am in order to prepare for their performance and found Glasgow pleasantly dry- the rain that had been affecting Glasgow on the Friday had passed leaving sunny and breezy conditions, though underfoot conditions were definitely soggy. Playing first out of fourteen entered bands in the Grade 4A qualifying heat 1 contest, the band put in a confident and controlled performance of their March, Strathspey and Reel set. When the results of the qualifying heats were announced at 2.00pm, Tweedvale were delighted to find that they had qualified for the 12 band final. This meant a second performance of their March Strathspey and Reel set, the band again playing first out of the twelve qualified bands at 4.15pm. If anything the second performance was even better than the first and the band came off the contest field feeling that they had put in their best performance of the year so far. Another 2 hours were to pass before the march past and prize giving ceremonies commenced and it was well after 7.00pm before the results were announced. When the results were finally announced the band found that they had unfortunately not made the price list. The band came 12th in the final, with the judges placing them 11th and 12th for piping, 8th for drumming and 9th for ensemble. This was still a satisfying result given how unexpected qualification for the final had been. It was a relatively happy, though tired, band that departed Glasgow at close to 9.00pm after a seriously long days’ piping and drumming. Tweedvale’s competition season now has a two week break. Following on from this in early September are two local pipe band contests at Peebles and Innerleithen which will round out Tweedvale Pipe Band’s competition season. Contest venue – Glasgow Green, Glasgow. Number of Side Drummers – 5. The full results of the World Pipe band Championship Grade 4A Qualifying heat 1 can be found here. 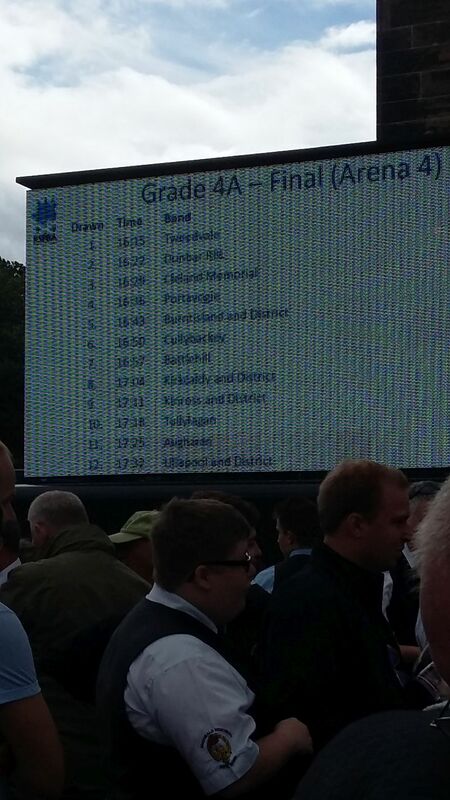 The full results of the World Pipe band Championship Grade 4A Final can be found here. 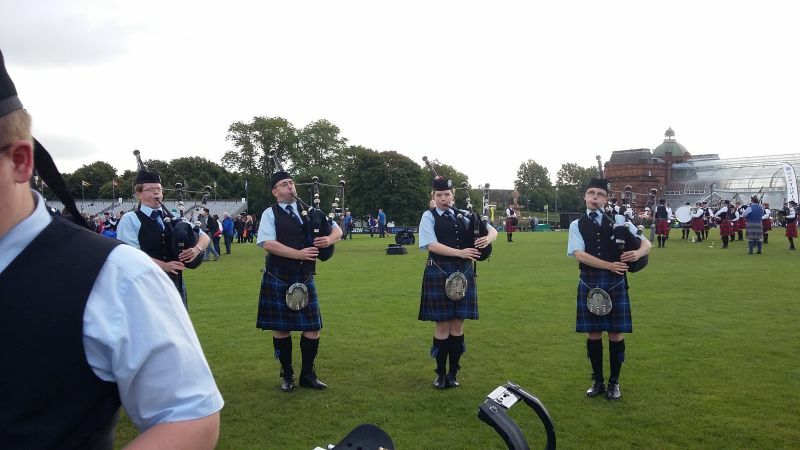 Early August, Saturday 6th, saw the band travel to North Berwick to participate in the Royal Burgh of North Berwick Highland Games at Recreation Park, North Berwick. The North Berwick contest was played out in dry sunny conditions that brought out large crowds to view the pipe band contests. The band had been drawn to play 6th out of 8 entered bands but due to withdrawals ended up playing 4th out of 6 bands in the Grade 4A March Strathspey and Reel contest. Tweedvale Pipe Band’s performance was much improved on the previous weeks display at the Scottish though there were still one or two issues. More annoying though was the loudspeaker positioned so close to the band competition circle that the commentary for the dog handling display being held in another part of the arena was clearly audible by the band DURING the bands performance – it was incredible distracting!! Notwithstanding this distraction, the band successfully completed their performance and spent the rest of the afternoon around the arena waiting for the march past. When the results were announced, Tweedvale Pipe Band found that they had been awarded 4th place in the open contest winning the RSPBA Lothian and Borders Shield. The winning band was Kirkcaldy & District. A closer analysis of the result showed that the band had been placed 2nd and 3rd by the piping judges, 5th by the drumming judge and 3rd by the ensemble judge. North Berwick is unique in that there is a “contest within a contest”, confined to bands from the Lothian and Borders area. In the Grade 4 confined contest, the band won third place and lifted the Craighead Trophy. Contest venue – Recreation Park, North Berwick. Number of Side Drummers – 3 in Grade 4 & NJ MSR.